NEW YORK — It’s been a bumpy ride all year long full of inconsistencies and frustration. But the Longhorns are now one win away from winning a championship. 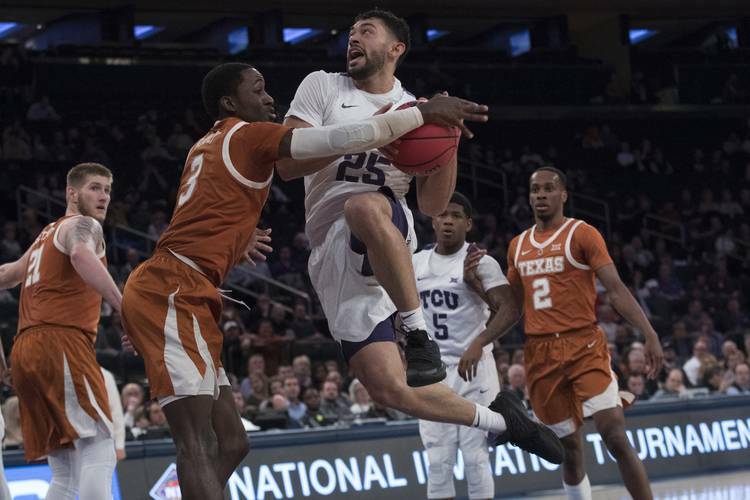 Texas nearly frittered away another double-digit lead against TCU, but coach Shaka Smart’s club held tight down the stretch for a 58-44 win in the NIT semifinals. Texas (20-16) has now won four straight and advanced to the NIT championship game against Lipscomb (29-7) on Thursday at Madison Square Garden. The Horns will be gunning for the program’s second NIT championship. Texas also won this tournament in 1978. Tuesday’s game, the third in this long-running series between the two schools this season, wasn’t exactly worthy of the venue. But Texas senior Kerwin Roach II rang up a game-high 22 points on 9-of-14 shooting as some sort of cosmic payback for missing out UT’s senior day against TCU in the regular-season finale. Fellow senior Dylan Osetkowski had 13, and the Longhorns’ defense just smothered the Frogs (29.3 percent shooting) all night long. The offense was hard to watch. “That was a root canal,” one broadcaster muttered on press row. But Texas’ defense was a total team effort. Matt Coleman III drew two charges, and Kerwin Roach II stood in there for a third. The Frogs went 0-for-9 during the middle portion of the second half and couldn’t make up any ground. TCU’s Desmond Bane was going to lead his team to victory or defeat. It was defeat as Bane finished with 11 points on 5-of-14 shooting. Jericho Sims is a quiet type but he’ll respond when challenged. That’s exactly what TCU’s Kevin Samuel did in the first half. Samuel went up and over Sims and just posterized the Texas sophomore with a “SportsCenter”-level dunk. But the 6-foot-9 sophomore just kept playing. Samuel tried to do it again later in the half, but Sims held his ground and forced Samuel to miss. Sims went to the other end and scored. His two-handed flush to close out the half pushed UT’s lead to 15. This could have easily been a blowout. It came down to all the little things. Texas missed just enough layups and point-blank shots to keep TCU close. Roach missed 3-of-4 free throws early in the second half. Courtney Ramey tried to throw a bounce pass to Roach, who wasn’t looking, and it resulted in a turnover. The Horns saw their 15-point lead get whittled down to five with 11:24 remaining. It was put-on-your-seat-belt time. Bane had 34 points when these two teams met in Austin on UT’s senior day. Bane needed 9 minutes, 31 seconds to get on the scoreboard this time. The Horns’ defense was just suffocating in the first half, holding the Frogs to 7-of-25 shooting. They closed the half 1-for-10 and didn’t score any field goals in the last 5:13. It sort of personified the entire season — great defense at times, unpredictable offense on the other end. The Horns missed layups and put-back dunks but still had a 31-17 lead on Roach’s 13 early points and Febres’ eight. The 17 first-half points allowed was a season low for Texas. Neither Lipscomb nor Wichita State played up to the venue, but the Bisons pulled out a 71-64 victory in the other NIT semifinal. Garrison Matthews had a game-high 34 points and practically did it all. He sure took all the shots; Matthews was 9-for-22 shooting. Texas beat Lipscomb early in non-conference play last season 80-57 in Austin.